How do I update the APN settings on my iPhone? In newer iPhones you can update your APN (Access Point Name) by looking in: Settings > Mobile Data > Mobile Data Options > Mobile Data Network. If you have an older iPhone (or one that was originally locked to a network), which does not have an option to update its APN settings, use the link below to download the APN configuration file. Your iPhone needs to be connected to WiFi and either click the link below or type it into your Safari browser. You need to download it to your phone and it will automatically update the APN. Viewing it inside your email will not work, you need to download it, in your Safari browser. You will get a message "This website is trying to open settings to show you a configuration profile. Do you want to allow this?" - press Allow. Telecom Plus is the company that produced these APN settings for us and is correct. - press Install. (Enter your passcode if needed). 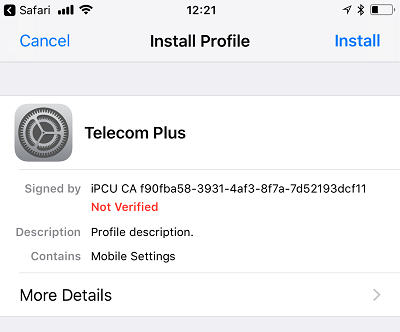 You may get a message "The authenticity of Telecom Plus cannot be verified", if your phone does not have a current Internet connection and can't reach the verification server. It is safe to - press install. Our APN has been installed and set as the default.